Eighty (80) Standard Class 4 4-6-0 steam locomotives were built by British Railways in the 1950s. Six engines survived for further use following the end of steam use on British Railways. Nos.75000 to 75009 and 75020 to 75029 were allocated for new to the Western Region with some moving to Worcester for a short period in the late 1950s. By the middle of 1965 it was becoming increasingly obvious that Worcester's allocation of 'Grange' and 'Hall' class locomotives were becoming increasingly unreliable and a decision was taken to move six of the Standard Class 4s to Worcester to see out the end of steam use. Accordingly Nos.75000, 75003, 75005, 75022, 75025 and 75029 arrived in June 1965. 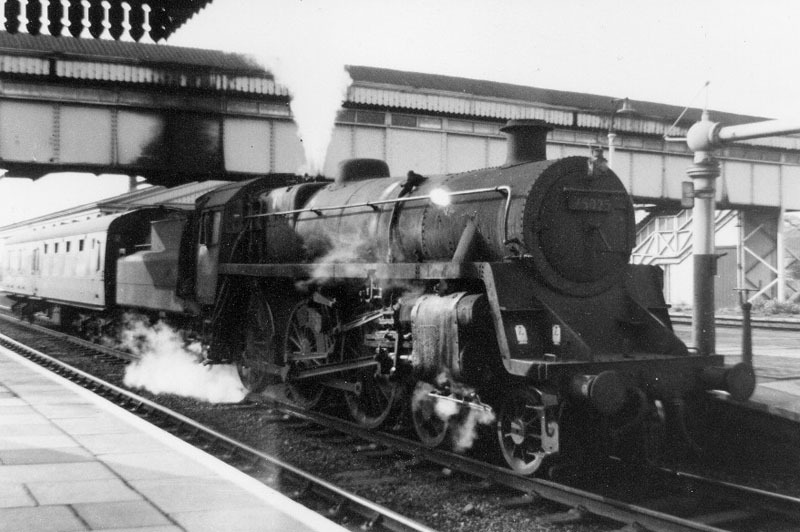 BR 'Standard' Class 4 4-6-0 No.75025 was a frequent visitor to the area and was based at Worcester on three occasions. It arrived for the last time in 1965 and was one of the final batch of steam locomotives used at Worcester. This photograph was taken by Derek Parsons on 13th August 1965. Nos.75003 and 75005 had both been based previously at Worcester. No.75005 was withdrawn in September following collision damage and No.75003in December but the other four survived to be withdrawn at the end of steam. No.75022 was the last steam locomotive used as Honeybourne banker on 30th December 1965.